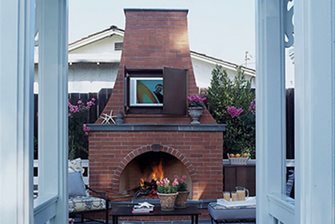 This lovely freestanding fireplace is well scaled to create a strong end point in an otherwise open space. However, the red brick and golden flagstone are not particularly analogous color tones. 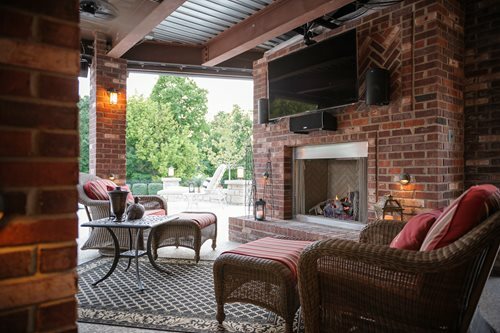 When a patio structure or the home architecture features brick in the facade or detailing, it should be extended to the outdoor fireplace so there is a cohesive appearance to the outdoor room. Used brick, whether antique or reproduction, has depth and diversity so it blends in with other antiqued surfacing such as finish metals and furniture. This beige brick, with its clean geometric lines, demonstrates how well such veneers suit modern architecture. Light brick opens the door for more unusual results that give an outdoor room the same unique quality as one indoors. 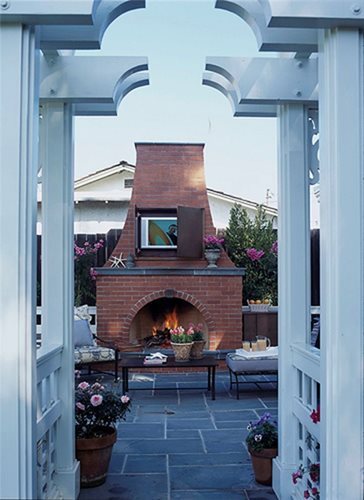 Here the brick fireplace creates a nice clean surround for the outdoor TV set on the chimney above the firebox. This is a brilliant idea to extend interior rooms into outdoor spaces with very soft transitions. Is a Brick Fireplace Right for Me? 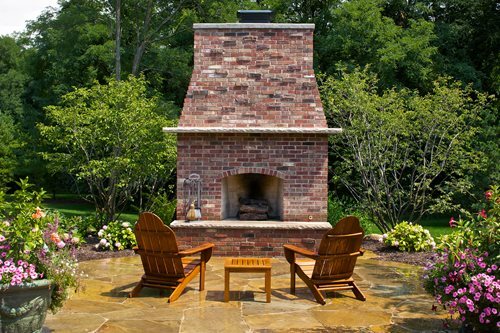 Outdoor fireplaces with brick veneer are driven by two factors: architecture and region. New England and the Deep South are strong users of brick in homes of all kinds. Brick homes appear elsewhere too and whenever there is existing brick on the home it makes sense to extend the same brick into exterior structures. The key is to find brick that matches the home, which can be a challenge with some of the 1970s, manufactured used brick which may no longer be available. Unlike other veneers, brick is made of clay, which occurs naturally in most states. It is shaped, and then fired in ovens to provide the very hard and durable unit that stands the test of time. The origin of the clay itself determines color, which ranges from cream to very dark brown, but firing temperatures can influence brick color too. The majority of bricks are a reddish color. Woody of Woody's Custom Landscaping in the rainy Northwest reports that: "Red brick is out of style up here. It's no longer in style so we do very little in this area. 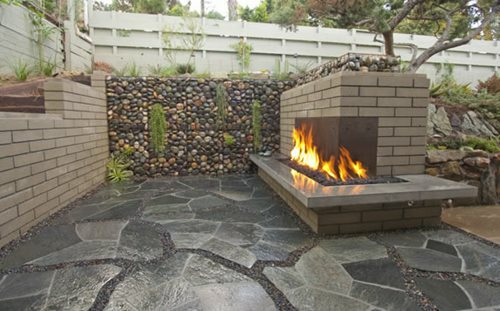 But when a customer does want that look, they choose dark clinkers and black brick." Clinkers are vitrified brick which is much more dense and heavier than red brick. They're fired at higher temperatures which yields distorted shapes and a darker almost purple color. While originally discarded as "mistakes" by the factory, the Arts and Crafts movement a century ago utilized these rejects in a whole new way. The irregular coloring and black burn marks defines creative brick work of this era. Many of our contemporary brick styles directly relate to these roots. A new trend is hand made bricks in high demand for remodeling older or historic homes. The slight irregularities are what give this choice its desirable appearance. However, this is the most expensive brick because it is slower to make due to increased hand labor at the plant. 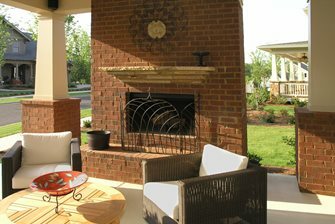 One benefit of brick is that it is precisely made and bricklayers are capable of creating a variety of patterns. 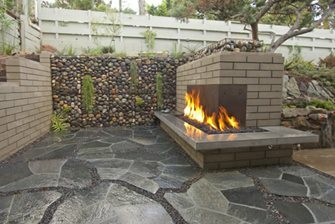 With all the varying surfaces on an outdoor fireplace there are many opportunities to create visually pleasing details drawn from existing interior fireplaces. 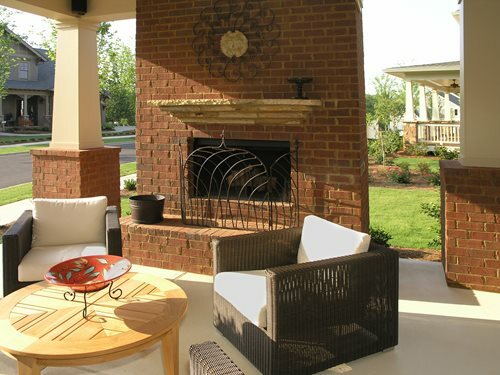 Whole brick - This is the least common veneer due to the amount of material necessary to cover an entire fireplace. Weight of each brick demands specialty support materials to ensure it will not pull away from vertical walls. Such additional surface preparation drives costs upward unnecessarily. Half brick - The width of a half brick helps it stand solid against a wall, and since less material is used costs are lower. Thin brick veneer - This may be just an inch thick and is treated a lot like a tile. Today there are many variables in how this material is made to yield a wide range of colors and patterns. Some sources use recycled products or add lightweight components to reduce the overall weight of the product. Less weight means anchorage of the veneer need not be as substantial. It also lowers shipping costs, reduces the need for skilled brick layers, and is easier to apply.